cryptonaut-in-exile: Confidence in organized religion is still amazingly high, all things considered. 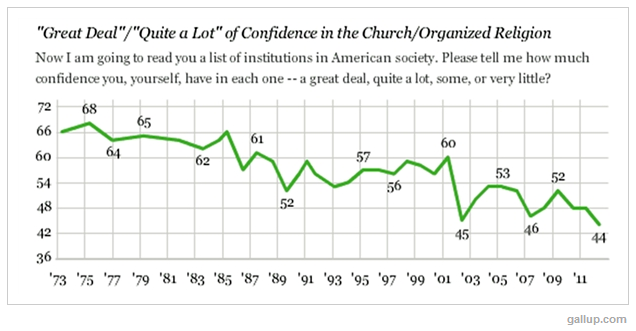 Confidence in organized religion is still amazingly high, all things considered. 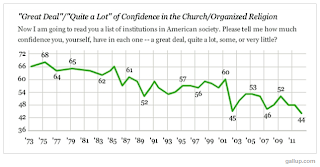 Americans' confidence in religious institutions has hit an all-time low, with only 44 percent expressing a "great deal" of confidence in organized religion, according to a new Gallup survey. 1. It is still stunningly high. Hard to imagine what there is to have confidence in? 2. If sheltering an elite army of child molesters, demeaning women, hostility to gays, regressive politics, and a radical insistence on teaching hocus-pocus to school children isn't enough to shake people's confidence, what does it take? Bret had a post on ABT recently about Ambiguism which struck as me as spot-on. Most folks of our generation (I'm more a child of the 70s, but close enough I'll lump us together) seem to be religious in the way Bret describes. There are the real dyed-in-the-wool Jeebus freaks, for sure, but you can tell by their crazy eyes they'd be gung-ho for any woo that can be used to make them feel self-satisfied. For the most part, it seems they are just "going along" with the religion of their parents, they got some dodgy habits forced on them as kids and just find it easier to keep doing the same old same instead of making the awkward or painful choice to deal with world openly and honestly. Ignore the insane/fundamentalist bits, accept the authority of clergy to speak on matters they clearly don't know anything about, and incorporate just enough of the institutionally approved rituals and manners into your daily life and organized religion-lite produces a manageable level of cognitive dissonance. Which is glossed over by the warm fuzzies received from your co-religionists, take comfort in your mutual approval of one another's willingness to play along.